The Usual Suspects. Of course. Great story telling, great acting for Spacey. Good plot. Other movie favourites include '12 Angry Men', 'The Hunt for Red October'. What are your favourite movies ? Stumbled upon it here today. 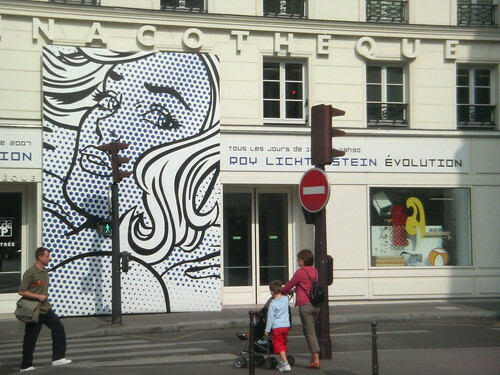 Roy Lichtenstein, originally uploaded by rsepulveda. I can't believe I waited until the very last day to visit an expo next to my office, about my favourite painter... Too much work I suppose. I missed the Guggenheim expo in 1995 in NYC (was there the year after), managed to spend 2 hourd in London about 5 years ago for at the Hayward Gallery for a great expo. This one was a bit smaller, focusing on the creative process of the painter. Interesting, but not a great one. Some great masterpieces nevertheless. don't know why, just do. Love Philippe Starck. The Cooper-Hewitt Museum. The V&A Museum. Simplicity and purity. And hence when I see a great site design, I notice. Check this one (congrats on launching it) vs. this one. Which one do you prefer ? 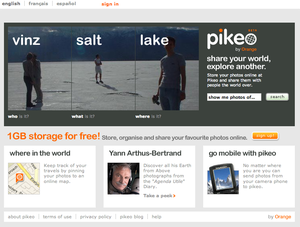 I think the Pikeo team (hurrray to Céline, Sean and Pascale) did a GREAT job on graphical design. Williams-Sonoma has also been a long time favourite website design and furthermore, a great job in graphical identity: their shops, brochures, wbe sites all have the same look & feel. Anyone can point me to a portfolio of great design work on the web ? I'd love to have a look. Or links to sites you just like. Tonight, as I was looking into the latest submissions from our beta users, I discovered some amazing animations with Sand. I had never seen this, nor heard about them. It seems it's a huge trend, and these are live performances. I asked the person whether I could reblogged, and he agreed to, although I'm not sure who owns the rights to these videos (please let me know whether I'm infringing here). DSC00345, originally uploaded by rsepulveda. As I was coming home last night, I stopped by an art dealer near my place: I've always liked sculpture, bronzes in particular. I had never really heard of the Jacques Le Nantec, but his work is really nice, with lots of attention to detail, and a huge influence of his libido of course. I took a series of pictures of the sculptures on sale that I liked most. As with any sculpture, you have to look at them often, from different angles. Here's my Flickr set. Le Toi(t) intérieur, originally uploaded by rsepulveda. I attended a great private auction diner tonight in honour of a nice association (thanks Christophe for the opportunity to attend). Galienni, a French artist that I was happy to recommend to the event did a great performance = painting the work of art live (you can see all pictures of the process on Flickr). His painting was eventually sold for 2300 euros, almost doubling his last price of 1200€ for one of his paintings at the Drouot auction house. Well done Stéphane! 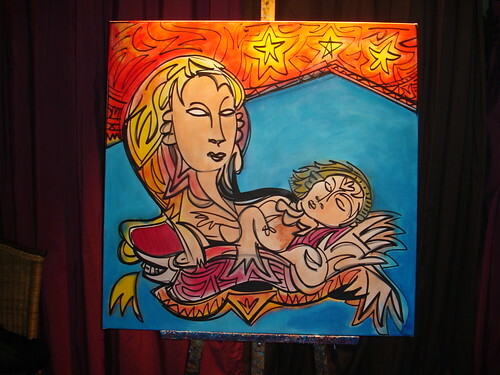 I'll let him explain the meaning & symbology (beautiful) of the painting on his own blog at http://www.galienni.com.